There was a lady in Target this week who was one of Those People. When I said yes, she gave me what may have been intended as a sympathetic look, but was really almost a glare. “I had one at a time, and that was hard enough,” she said, with a meaningful nod at her young teenaged son. He was playing peek-a-boo with Lucy, which did not brighten her mood. Now, I’m sure her son doesn’t sweetly play peek-a-boo with babies all day, and I’m sure one at a time is plenty challenging enough. 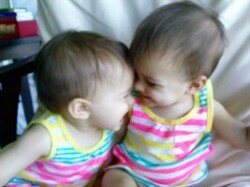 But people who react with pity or condescension when they see twins make me sad, both for them and for my babies. If the girls could ask me if they’re difficult, I’d tell them they sure can be– like when they try to shove each other off my lap, or hit and scratch when they don’t want to share, or when they’re both HANGRY and crying and dinner isn’t ready and they don’t want the graham crackers, goldfish, raisins, crackers, or cheerios I’m offering. But I’d also tell them I think having twins is extra special and sometimes I think it’s secretly better, too. Having a playmate isn’t something most oldest children get for a few years, but here they are exploring the world with a built-in best friend. They’re learning to share and communicate their wants and feelings with someone who actually gets them. And they have these amazing moments every day lately where one of them will stop playing and lean over to grab her sister and give her a big wet, smoochie baby kiss. It can go on to uncomfortable and slobbery lengths. And those kissy sister moments are the best moments. I tell people like The Target Lady that– and you’d be surprised how many of Those People there are. I hope those are days they’re just exhausted, the baby didn’t sleep, the 12-year-old is going through a rebellious phase, their toddler pooped all over the tub… and that two happy little girls and their lucky mommy can help restore a little joy to their day and remind them how much good there is in raising a family. It’s a smoochie, screechy, messy, happy process here, and I wouldn’t trade it for a thing in the world.